The South Bronx Rising Together (SBRT) initiative’s vision is to transform the South Bronx, specifically Community District 3, currently the poorest in NYC, into “a vibrant community of infinite opportunity where people aspire to live, work, and raise families.” On July 18th, Kinvolved co-founder, Miriam Altman, and I had the chance to attend the SBRT’s “Deep Dive,” to learn more about how we could collaborate with other NYC organizations to achieve this shared vision for this high-potential community. As I exited the five train and headed towards the Urban Health Plan Care Pavilion, I was flanked by close to 70 stakeholders from 40 different organizations. We had commuted from different parts of the city (Miriam and I a full 17 subway stops from our Kinvolved home in Brooklyn). When we arrived, we were divided into seven tables. 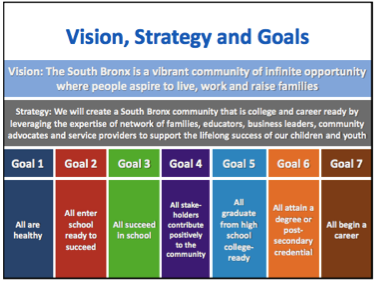 Each table represented a specific goal that would help the South Bronx meet the SBRT vision statement. Abe Fernandez of The Children’s Aid Society and Elizabeth Clay Roy of Phipps Neighborhoods explained the lengthy process they had undergone to establish the seven goals. Now we, the participants, were tasked with quantifying each goal into three quantifiable outcomes that would represent stepping-stones on the way to realizing the large vision. We were seated at the table for goal three, “All succeed in school.” In the minutes before the meeting had begun, we had gotten acquainted with our tablemates from organizations like the Children’s Aid Society, Columbia University, and the NYC Dept. of Education, among others. Like us, they had experience in the education reform movement and have committed their work to finding ways to best serve our city’s children. Still, the task was not easy. As we began our attempt to break down “success” into three quantifiable outcomes, we realized that success is a complicated concept. As a group, we didn’t want to reduce “success” solely to academics, and we didn’t want to prioritize one age group in preK-12th grade over another. The New York City Department of Education partner at our table pointed out that specific benchmarks were important for different reasons. Reading level and mathematics level are especially important at grade three as predicators for later success, but similarly high school readiness and long-term thinking skills are important during middle school. We learned that transition years, from elementary to middle and middle to high school, are especially formative. We considered the role that a community takes in the education space. Based on the experiences of past educators and parents at our table, we didn’t believe students could be fully successful without the investment of the community. We recognized the need to establish a shared the community value of education. We talked about the importance of nurturing our students. As a third grade public school teacher, I recognize the need to focus on our gifted students as much as we focus on our more struggling students. Other people at our table also talked about making sure students who drop out can re-enter schools and providing students access to mentors. The discussion was interesting and fruitful. We raised many indicators of success to which I hadn’t given previous thought and might translate into my life as a teacher. This fall, I look forward to incorporating professionalism and tailored mentorship into my third grade classroom. First: Students meet grade level expectations (including reading and math levels, attendance, other academic areas, high school readiness in middle school, and college and career readiness in high school). Second: Students are supported and nurtured by their school (including access to a mentor, support systems for failing students, opportunities to re-enter school after dropping out, and enrichment program for gifted schools). 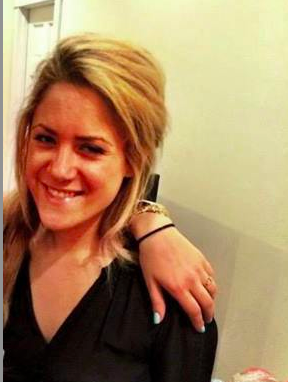 Third: Students should have access to the community (be it community programs, outreach events, and backing of school events by community vendor, i.e. the feeling that the neighborhood values education). We really enjoyed our time with the South Bronx Rising Together coalition, and we were excited to be in a room with so many impassioned people who are committed to strengthening the South Bronx community. We look forward to developing the partnerships we established, and are interested to see how the coalition will proceed to help make these goals and this vision a reality.